Thirty Keyes takes its place alongside a collection of galleries, exhibition and event spaces, showrooms, boutiques and eateries serving a community of creative entrepreneurs, design-minded tastemakers and art lovers alike. Johannesburg's youngest and undoubtedly most inviting precinct, the Keyes Art Mile comes packed with serious cultural credentials. Aligned with the arts from the outset, the Mile has been designed as a curated, creative destination that effortlessly merges modern and contemporary art, leading local and international design, category-defying cuisine and an ever-evolving programme of exhibitions, events and entertainment. The Art Mile was born from the area's highly regarded and long-established arts heritage—most notably the hundred-year old Everard Read Gallery and its contemporary Circa Gallery counterpart—with the view of extending its reach through galleries such as internationally acclaimed SMAC Gallery and cutting edge newcomer TWRW Gallery. In fulfilling this vision, the Keyes Art Mile has assembled a considered set of tenants specialising in fine art, furniture and fashion, complemented by a spectrum of restaurant options ranging from fast food to fine dining, and housed within an iconic architectural setting. With its ongoing improvement of, and investment in public space, the Art Mile—under guidance of StudioMAS as urban design partner and Fieldworks as landscape design consultant—has seen to the paving of roadways, widening of pavements and the planting of indigenous trees along its titular avenue, flanked by a vertical greenwall of grass and bulb species endemic to the highveld area. Expanding on its creatively-centered agenda, the Art Mile is set to introduce another StudioMAS-designed cultural icon to the neighbourhood in approaching months. A soon-to-be landmark structure, the as-yet unnamed development is intended to serve as a large-scale, multifaceted venue for art in all its forms, and a distinctive destination for both local and global audiences. The architectural companion piece to this forthcoming cultural beacon, Thirty Keyes is naturally primed to partake of its creative spirit, with residents enjoying direct access to its facilities, preferential entry concessions and an intimate association with its offering. The undeniable epicenter of Joburg's prolific, challenging and ever-evolving art scene, Keyes Art Mile plays host to both the city's most established galleries, as well as its defiant young contenders. Frances Goodman, Romancing the Mirror (detail), 2018. Hand-stitched sequins on canvas,146 x 109cm. 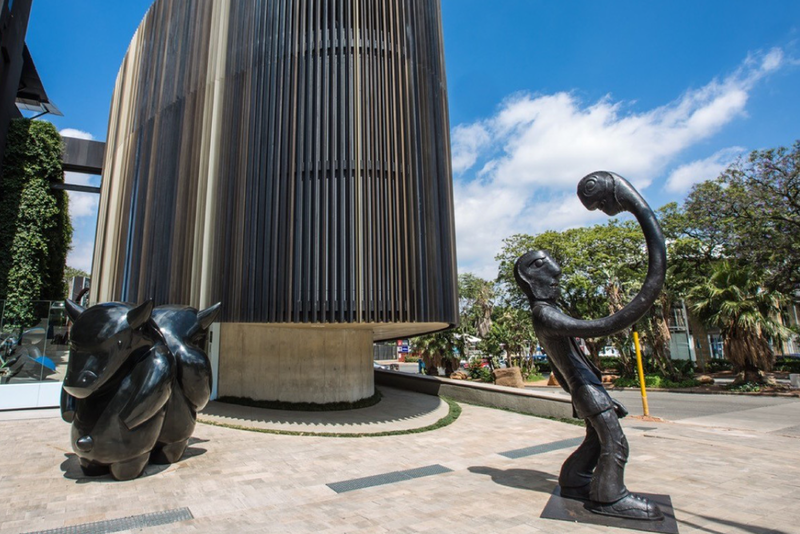 Home to some of Johannesburg's most iconic landmarks, the Art Mile remains a hotbed for architectural innovation, most notably StudioMAS-designed Circa Gallery and The Trumpet. Social to its soul, the Art Mile thrives on a series of signature events that brings Johannesburg's creative community out to play—from organic citrus, charcuterie and small-batch honey at The Pantry Market, to Art and Design Saturday's curated cultural programmes, to food carts and fresh beats every First Thursday. A gastronome's playground, the Keyes Art Mile satisfies every taste, from the award-winning, wood-fired culinary theatre of David Higgs' Marble Restaurant, to crowd-pleasing cheeseburgers, fries and frozen custard at BGR, to killer Asian fusion courtesy of Momo Kuro. Home to Johannesburg's most design-minded boutiques—from Shelflife's freshest kicks to Kartell's catalogue of iconic furniture pieces, the Art Mile boasts a curated selection of retailers that begs for post-brunch browsing. Fully integrated with the neighbourhood, Thirty Keyes enjoys the unique position of offering its residents exclusive Art Mile perks and preferential services. Stepping out looking your best has never been more effortless, with laundry, dry-cleaning, mending, pressing, tailoring and shoe shine services right on Thirty Keyes' doorstep. Conveniently positioned at retail level, within easy residential reach, we've partnered with a clothing care specialist to ensure your wardrobe is always on point. Simply drop your load of laundry off on your way out, or alternatively arrange for delivery and collection with our concierge at the front desk. Have your apartment serviced on a daily, weekly or ad hoc basis, with a selection of high-end housekeeping services on offer by our preferred home care partner. Fully outsourced, the struggles of permanently domestic employment are no longer, with a highly experienced and efficiently managed team taking care of your cleaning on a pre-booked hourly basis. Used in conjunction with smart lock access control, your apartment can be managed remotely on much the same lines as a hotel suite. With immediate access to catering by the best of the precinct's portfolio of cafés and restaurants, Thirty Keyes takes ordering in to new levels of privacy and comfort. Paired with year-round precinct promotions exclusively available to residents, Thirty Keyes leaves little to be desired in venturing further afield than your own front door. From fresh floral arrangements to stocking up on your complement of everyday essentials, Thirty Keyes facilitates access to the things that turn your apartment into a home. One of Thirty Keyes' most defining features is its direct association with a forthcoming adjoining art venue development, designed by StudioMAS to integrate with its master plan for the precinct, as well as complement the Art Mile's existing architectural language. Intimately allied with Thirty Keyes, the adjacent space is directly connected to the residence's uppermost level by way of an aerial esplanade, while its piazza-like public concourse seamlessly extends from Thirty Keyes' studio and showroom spaces.